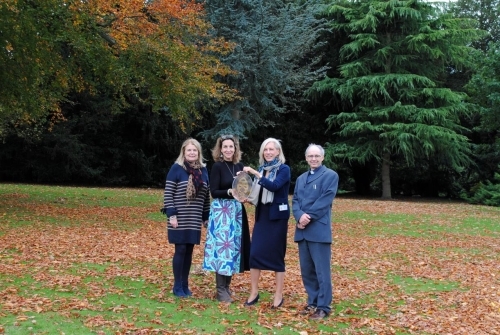 QM was absolutely delighted by the news that at its Annual General Meeting in October there was overwhelming support from the Old Margaretian Association (OMA) to fund the creation of a Quiet Garden in the very heart of the School grounds. The Quiet Garden will nurture spiritual and mental wellbeing, as it will provide a place of refuge from the busy demands of everyday life and will allow girls and staff alike to practice mindfulness in a peaceful, safe setting. It will also be a place that Old Margaretians can spend time in when they return to QM. There are 300 Quiet Gardens worldwide but very few of them are in schools, so in many ways we are ‘ground breaking’. Jessica Miles, QM Head said: ‘We are absolutely thrilled to once again have the financial support from the OMA that will make the creation of a Quiet Garden at QM a reality. Their previous support has resulted in the beautiful stained glass windows that help make St Margaret’s Chapel the wonderful, spiritual place that it is, so it is very fitting that once again, through their support, we will be creating another very special haven from busy everyday life from which the girls and indeed the whole QM Family can benefit’. The girls, OMA and staff will be involved in making the garden a reality, being asked to contribute their ideas as part of the design process. Pride of place in the garden will be a beautiful stained glass panel featuring the OMA crest in acknowledgement of their generous support and friendship. This project forms part of the Head’s Annual Fund Appeal which was launched at the start of 2018. To date, thanks to the very generous support of the QM Family, the Annual Fund has already been successful in seeing the completion of QM FIT, which encourages girls to run a mile or more every day, thus improving their physical wellbeing. Funds are also in place to purchase radio microphones which will be used across many areas of the School, enabling girls to gain confidence in presenting in front of an audience.